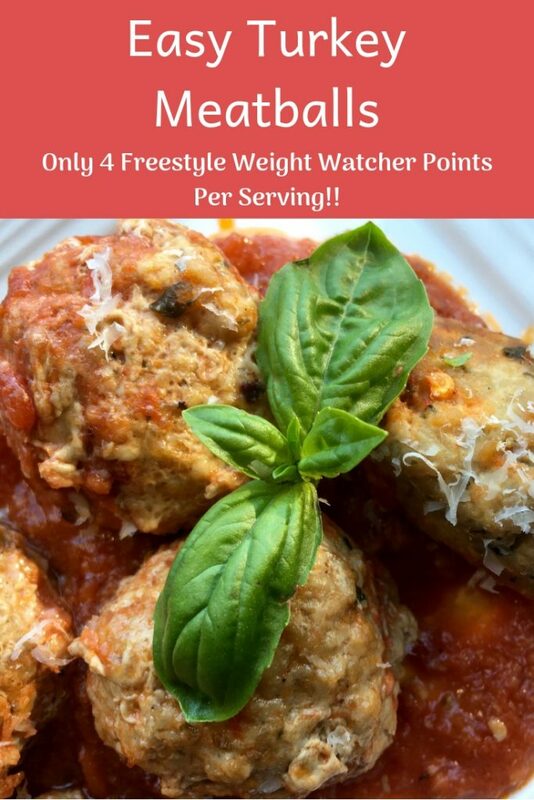 These scrumptious, baked turkey meatballs are a real crowd pleaser and come in at only 4 freestyle weight watcher points per serving. The combination of spices and fresh herbs pack tons of flavor into every bite. Plus, these meatballs freeze well, so make a double or triple batch if time allows. Then simply pull out of the freezer, reheat, and serve with spaghetti squash or zucchini noodles, both zero points, for a filling meal that is low in points. 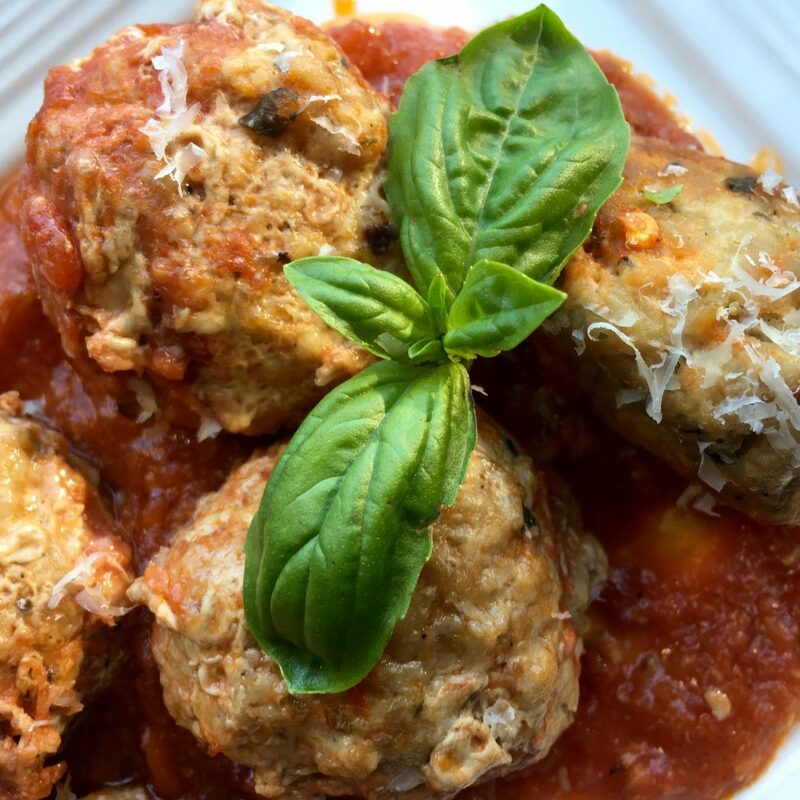 Tip: To help the baked turkey meatballs hold their round shape, bake them on their own first before adding the tomato sauce. Add fat-free ground turkey, eggs, Parmesan cheese, oregano, basil, parsley, garlic, onion salt, and crushed red pepper flakes to a large glass bowl. Season with salt and black pepper, to taste. Thoroughly combine mixture with your hands and divide into 24 equal-sized portions. (For larger meatballs, separate into 18 portions). Add more Parmesan cheese, if necessary, to bind the ingredients. 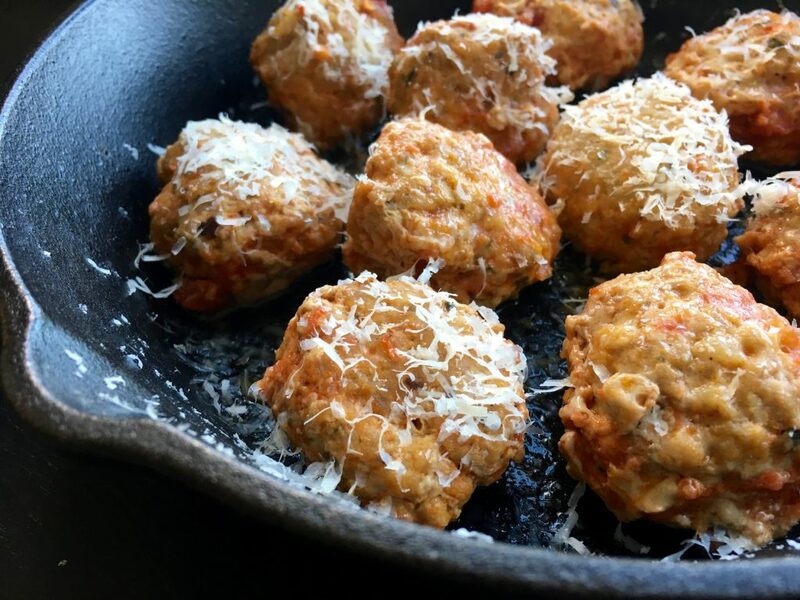 Gently roll each portion into a ball and place on prepared baking sheet, leaving room between each meatball. Place baking sheet in pre-heated oven and bake for 15-20 minutes. Remove from oven and transfer meatballs to prepared baking dish. Drizzle with additional tomato sauce and Parmesan cheese, if desired. Place baking dish in oven for approximately 10 minutes, or until sauce and meatballs are heated through. Remove from oven and serve immediately with additional tomato sauce, Parmesan cheese, and fresh basil, if desired.